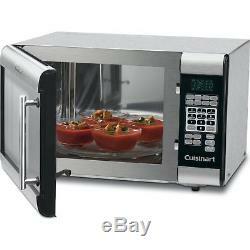 Cuisinart Stainless Steel Microwave (CMW-100) 1 Cu. A stainless steel interior and 25 preprogrammed settings put the Cuisinart Microwave Oven in a class all its own. The ideal cooking environment, nonporous stainless steel, will not absorb odors, moisture or food particles. Cuisinart Stainless Streel Microwave (CMW-100). Preprogrammed one-touch controls guarantee that everything from reheating coffee, to defrosting cutlets, to cooking fish or making 2, 4, or 6 strips of crispy bacon will be done right. This 1000-watt, 1.0-cubic-foot oven lets you cook a meal from scratch, and make it a little healthier, without any oil or butter. With its stainless steel interior, stainless steel door and sleek control panel, this is a new generation of microwave - from Cuisinart, of course! Stainless steel control panel and door with embossed Cuisinart logo and dark tinted glass window. Stainless steel interior absorbs no odors and is easy to sanitize. Two convenient defrost functions to defrost food by weight or time. Eight preset options with serving-size options for each (total 25): Popcorn, Beverage. Rice, Reheat, Fresh Vegetables, Frozen Vegetables, Baked Potatoes, and Bacon. Two-stage cooking operation: Allows microwave to be set so that first stage of operation (such as 15 minutes on defrost), is automatically followed by a second stage (such as cooking for 8 minutes). Instruction and recipe book included. Dimensions: 20.50" x 15.25" x 12.80. More Product Information for the Cuisinart Stainless Steel Microwave (CMW-100) 1 Cu. Please note that - depending on your geographic location - not all methods are available. Make sure to select the appropriate method. APO / FPO Military Addresses. Sellers are not responsible for service transit time. This information is provided by the carrier and excludes weekends and holidays. Note that transit times may vary, particularly during peak periods. How Long Does It Generally Take To Process An Order? How long does it generally take to process an order? What Should I Do If An Item Is Missing From My Order? If all boxes have been delivered but you're still missing an item, check the packing material for small items. For example our open-box merchandise which we sell at closeout prices. Can The Signature On My Package Be Waived? We apologize, but for security purposes, we cannot waive the signature on a package. Defective Item An item that was discovered to be defective upon receipt can be replaced with the same model only. An item that was discovered damaged upon receipt will be replaced with the same model only. International Customers Please be advised that our products are intended for a US market. If it is to be used outside of the US, please check in advance that it will work. Replacement We will send a product replacement after the authorized return has completed our receiving/inspection process. Please allow additional processing time after Holidays. Returning Items If you do not have the return form, we will provide it together with your RA number. Please fill in the requested information on our product return form, and carefully follow the instructions for return. Battery, charger, cords, straps, etc. The RA number or any other inscriptions must not be written or printed on the product box or packaging. We will not process the return if any of these conditions are not followed. Retuned merchandise that is lost or damaged during transit is solely the shipper's responsibility. When you receive your order, we recommend that you keep all packing materials in case you need to return the TV. If you just don't like it. You'll also need to pack the TV in its original box with all original packing material, and accessories. It is important that you inspect the TV (not only the box it came in) prior to signing for it. A replacement will be sent immediately after we are notified about the damage. If your TV does not seem to function properly. We'll help troubleshoot and determine how to solve the problem; if we can't, we'll arrange for service to assess the television. Opened packages of Apparel, Bedding or Linens. Consumables, including but not limited to, recordable media, film, tapes, batteries, paper, and ink. (substitute Buydig where appropriate) In addition, customers located in Pennsylvania should note that in accordance with a new law passed by the state in 2018, retailers including Beach Camera (Buydig) will be required to submit an annual report to the Pennsylvania Department of Revenue listing any sales made to customers located in the state. The item "Cuisinart Stainless Steel Microwave (CMW-100) 1 Cu. Feet" is in sale since Wednesday, November 28, 2018. This item is in the category "Home & Garden\Major Appliances\Microwave Ovens". The seller is "buydig" and is located in Edison, New Jersey. This item can be shipped to United States.